Lately, I have come to prefer buying books to read electronically . It’s not that I prefer the screen – far from it, I do enjoy the physical sense of flipping through the pages of a real, paper book – but I’ve found that ebooks have some distinct advantages. One of the most obvious is price. When Tom Perrotta’s new book, The Leftovers, came out, I immediately wanted to read it. I’ve thoroughly enjoyed some of this other books, including Little Children, Election, and The Abstinence Teacher, and I find the idea of the Rapture fascinating, so this was right up my alley. However, when I saw that the newly released hard cover was going to cost me $26, I felt compelled to check the price of the ebook on my phone and discovered it was available electronically for just half the cost. The other major advantage is convenience. As a parent with two kids, I find that time to read books is very limited. I’ve gone from reading at least two books a month before having children to just a couple of books a year. I recently was reading a science fiction novel that my father hand loaned me, and one day during an unexpected lunch break at work, I found myself wanting to read it. 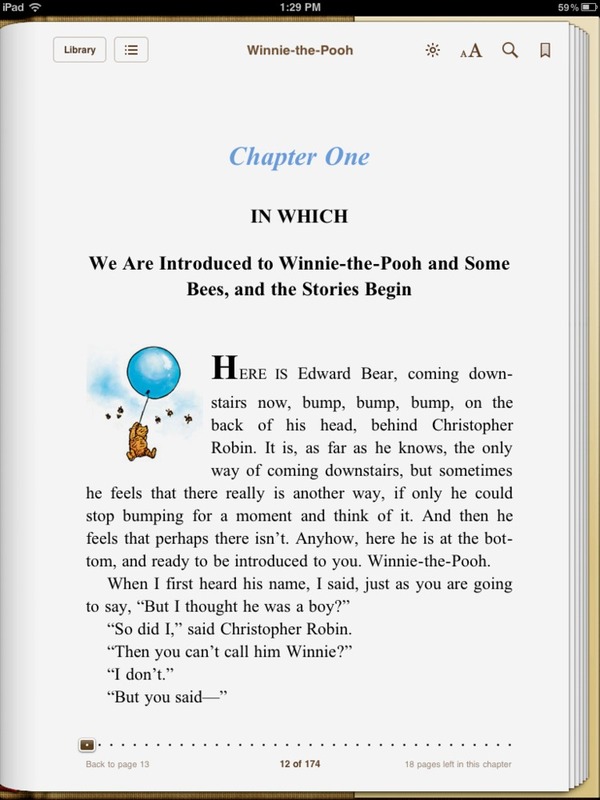 The book was at home, so I decided to pay the $8.99 for the ebook so I could keep reading right then. Unexpectedly, my reading pace dramatically accelerated after that point. I always had my iPhone with me, and I found myself reading the book at unexpected opportunities – waiting in line at the store, flossing my teeth while getting ready for bed, etc. As On The Media stated in their show about the future of the book, the iPhone is one of the best reading devices by virtue of “showing up” – it’s always with you. Which brings me to a conundrum. As a Jew who observes the rules of the Sabbath, every week I take a 25 hour break from using electronic devices from sunset on Friday to sundown on Saturday. It’s a great time to see friends, rest, go to shul, and curl up with a good book if you have some time. Unfortunately, most interpretations of the rules of the sabbath rule out the use of an electronic book reader, including e-ink devices like Kindles. So what is the observant Jewish reader of an ebook to do? There are two obvious ways to solve this problem. The first is to buy both a hard copy and an electronic copy, allowing you to read the hard copy on shabbat but retaining the electronic convenience of the e-device. Of course, this negates the cost savings, although I am sure that authors and publishers would love it. The second is to read two different books at once – a hard copy book on shabbat and electronic one during the week. That’s fine for people with lots of time to read on their hands, but as I said, reading time is precious to me. Trying to read two books at once would just be even more confusing and slow. I’ve found a third method. I’ll admit, it’s a little crazy, but it works: print parts of the ebook out. I’ve figured out a technique that is very efficient, allowing you to take transfer non-trivial chunks of an ebook to a printer in about ten minutes. 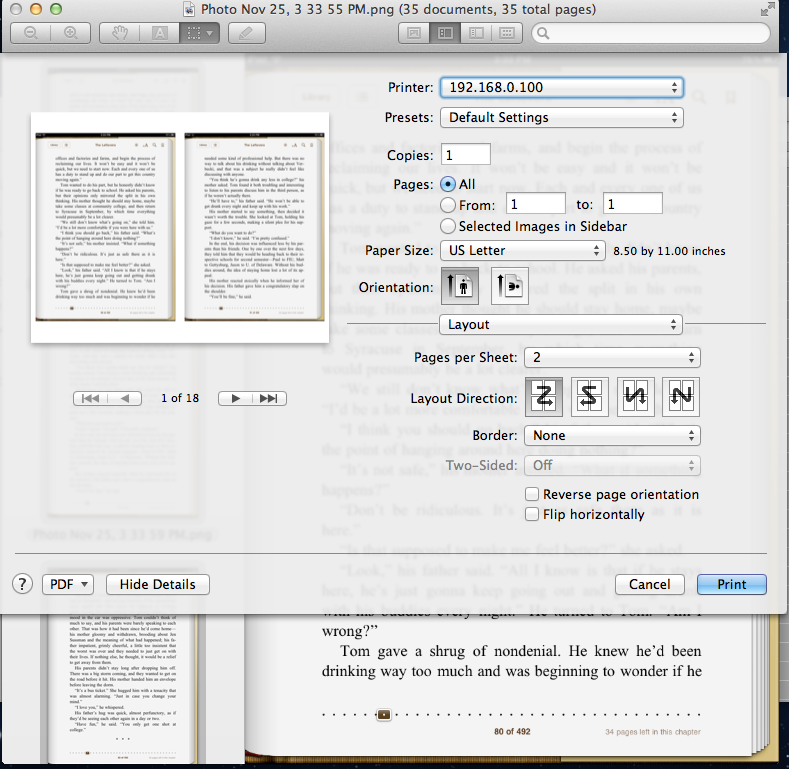 It’s not effective for giant sections of a book, but if you want to print a chapter or two, this is pretty easy. My instructions are specific to using an iPad and a Mac, but I’m sure that similar steps are possible on a Windows PC. This would also work with an iPhone, but it may be slightly more cumbersome due to the larger number of page captures required. 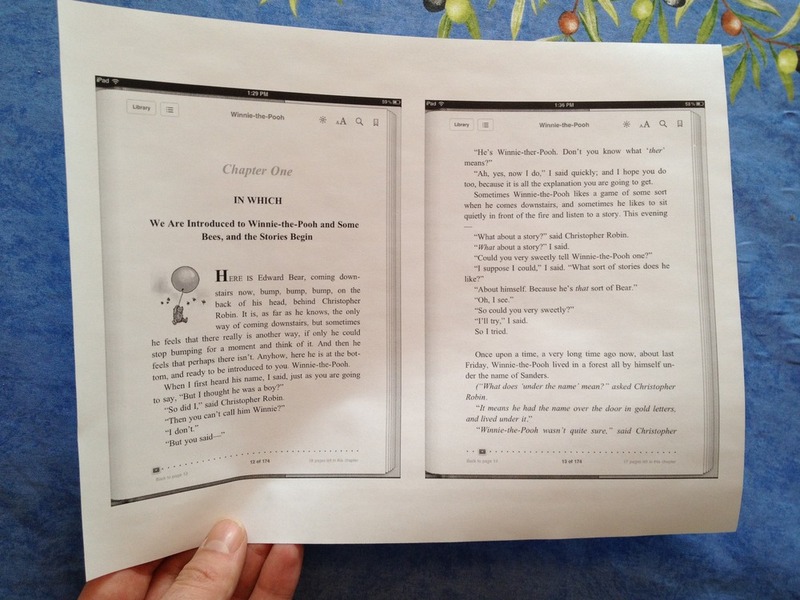 The first thing to do is page through the text you want to print for reading on your device. As you go to each page, press the home button and sleep-wake buttons simultaneously to take a snapshot of the screen. This goes pretty quickly, and you should be able to gather a few dozen pages in a couple of minutes onto your camera roll. I find that Landscape fits the most text per page. Dropbox is a wonderful program for managing files. It seamlessly synchronizes files between your mobile devices, computer, and a cloud storage drive. 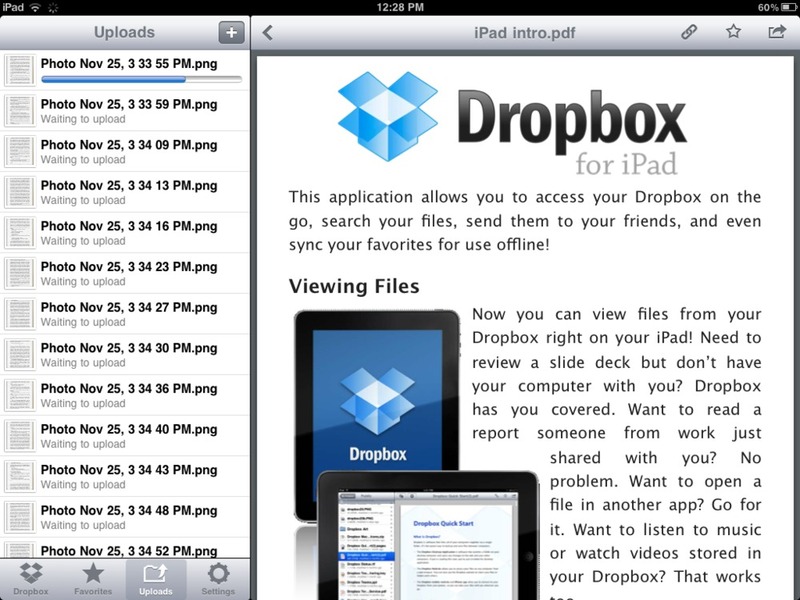 It is also very easy to batch upload files from the iPad, which is what makes this process so easy. This works best if you create a dedicated folder to upload the files to. You then can easily select dozens of photos at once to upload from your camera roll. Once you have selected the photos, the upload process will begin. Dropbox will rapidly upload the photos, one after the other. Since the images are screen snapshots with limited resolution, they are pretty small and will upload very quickly. Now go to your computer. 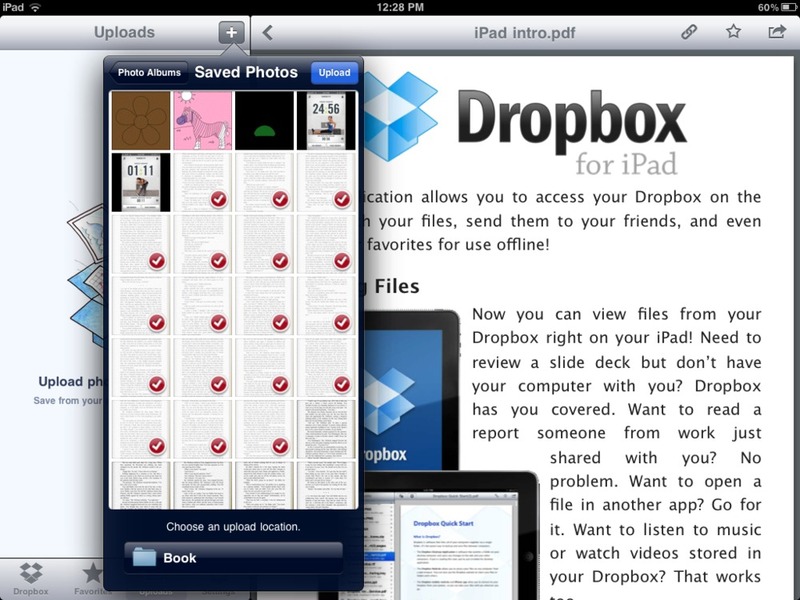 Dropbox will automatically transfer the photos up to your dropbox folder. Find the folder where you saved the images, and select all of the files. Then use the context-menu (two-finger or control-click) and open them with the built-in preview application. When the preview application opens, make sure to select all of the files in the “tray”, and then choose Print. From here, you can change the layout options to print either 2 or 4 images per page. Two pages per sheet is the most comfortable per page, but four is also manageable if you have good eyes. Print away, ideally using scrap paper! I am the first to admit that this is not for everyone. If you want to be reading over a hundred pages, it’s probably not worth it. However, if you really want to keep reading just a chapter or two of that ebook over shabbat, this works pretty well and doesn’t take very long. This entry was posted in Uncategorized and tagged books, home technology, iOS, iPad, judaism, shabbat, shortcuts. Bookmark the permalink.